are given as an illustrative example. is also called the contact potential or the barrier potential. layer will be from the N-region to the P-region. passes through the depletion layer and vice versa . process is accompanied with recombination processes. and the holes during the decay of the external voltage . eration volume (that is subjected to the incident light). Figure 1. A model for the considered cell. the incident solar photon flux . R, the reflection coefficient at the front surface. (ii) is a starting (initial) condition. ers at the boundary x = 0. W, is the width of the base region. V is the applied bias voltage.  let us apply the boundary conditions. V the open circuit voltage. The open circuit voltage is given as . ,TK is the absolute temperature. Jm is the diode saturation current density.  is the charge of an electron. E is the energy gap expressed as . where, a and b are parameters. ustrated graphically in Figure 4.
trated graphically in Figure 5.
and the recombination velocity for “W” as a parameter. 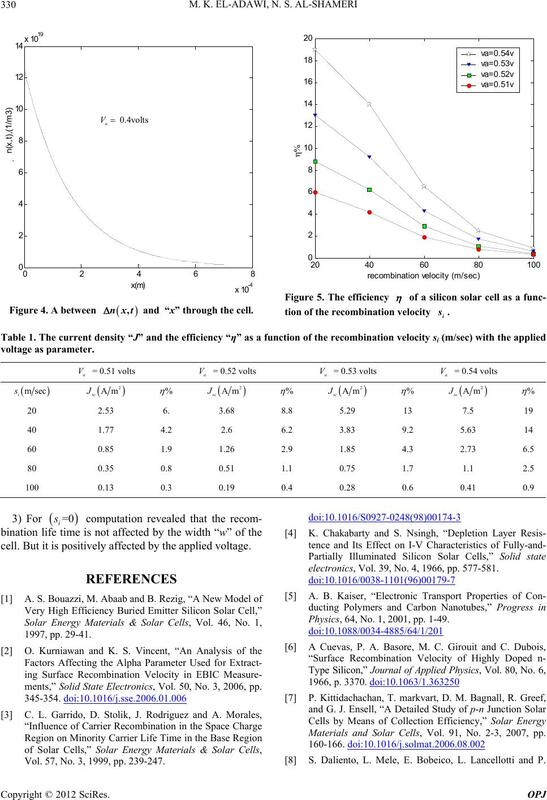 and the recombination velocity for as a parameter. voltage has positive effect on the efficiency. 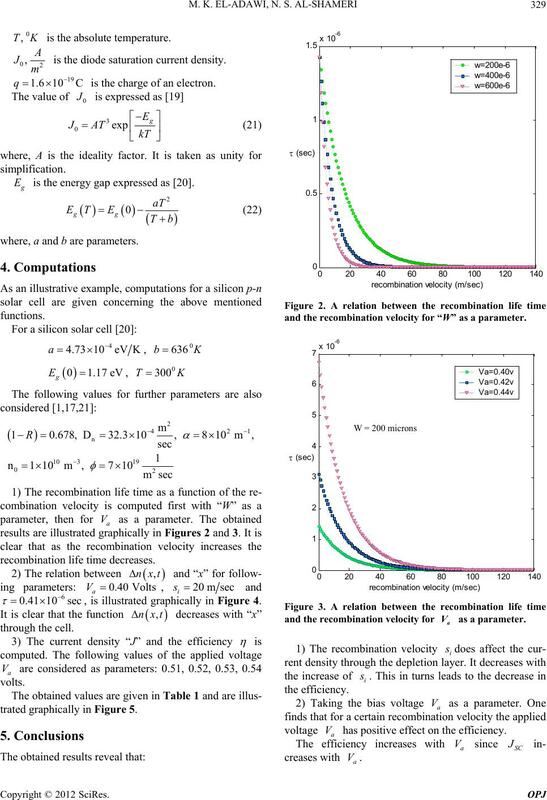 tion of the recombination velocity . Figure 4. A between “x” through the cell. cell. But it is positively affected by the applied voltage. 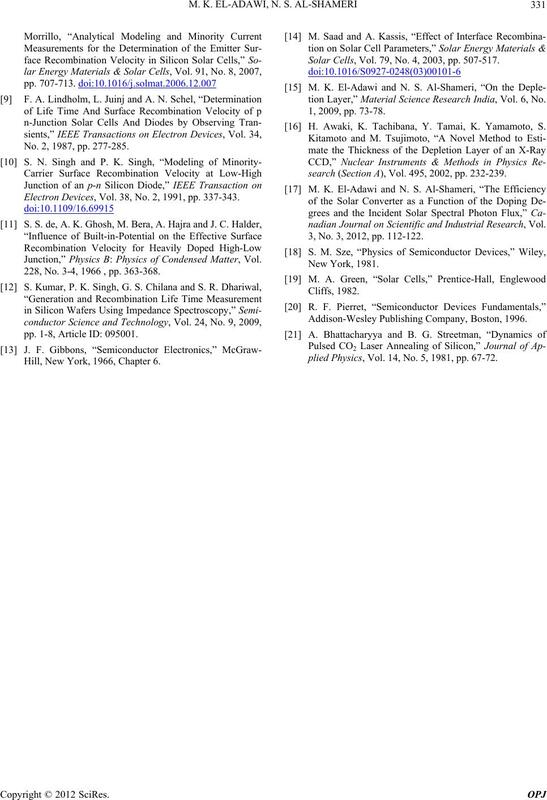 ments,” Solid State Electronics, Vol. 50, No. 3, 2006, pp. Vol. 57, No. 3, 1999, pp. 239-247.
electronics, Vol. 39, No. 4, 1966, pp. 577-581. 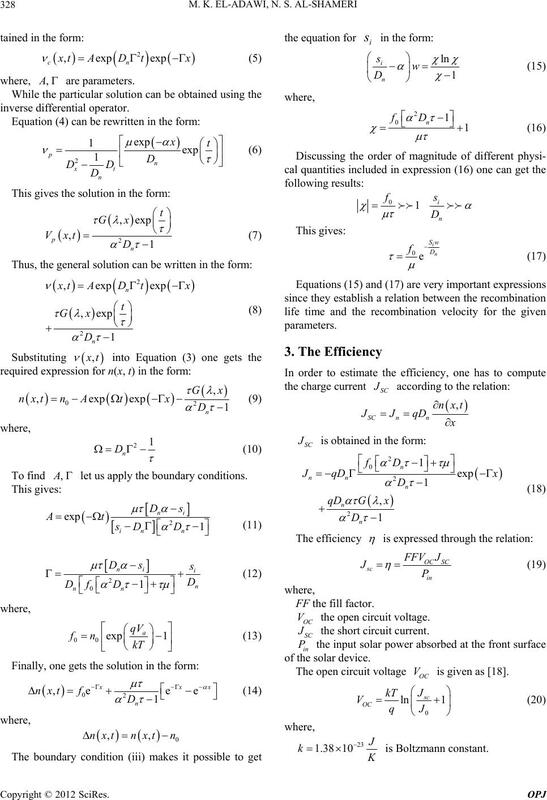 Physics, 64, No. 1, 2001, pp. 1-49. Materials and Solar Cells, Vol. 91, No. 2-3, 2007, pp. S. Daliento, L. Mele, E. Bobeico, L. Lancellotti and P.
No. 2, 1987, pp. 277-285. 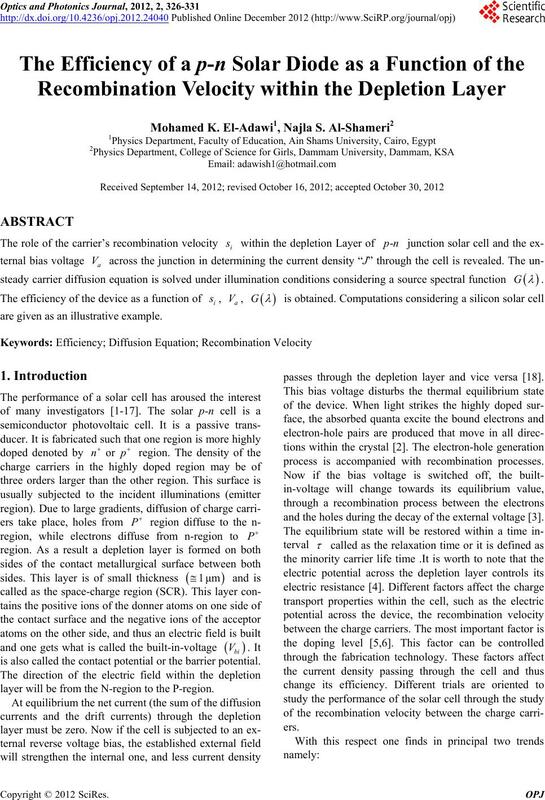 Electron Devi ces, Vol. 38, No. 2, 1991, pp. 337-343. 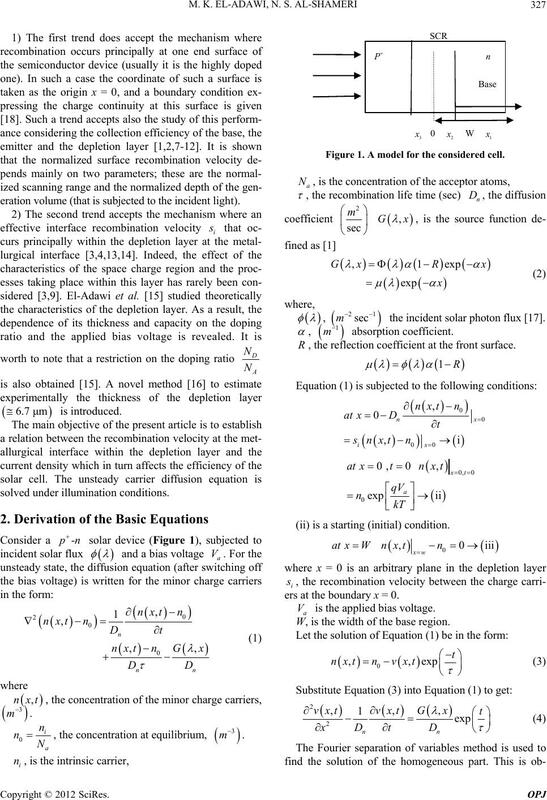 Junction,” Physics B: Physics of Condensed Matter, Vol. 228, No. 3-4, 1966 , pp. 363-368.
pp. 1-8, Article ID: 095001. Hill, New York, 1966, Chapter 6. Solar Cells, Vol. 79, No. 4, 2003, pp. 507-517.
tion Layer,” Material Science Research India, Vol. 6, No. H. Awaki, K. Tachibana, Y. Tamai, K. Yamamoto, S.
search (Sect ion A), Vol. 495, 2002, pp. 232-239.
nadian Journal on Scientific and Industrial Research, Vol. 3, No. 3, 2012, pp. 112-122. Addison-Wesley Publishing Company, Boston, 1996.
plied Physics, Vol. 14, No. 5, 1981, pp. 67-72.